Since the beginning of 2010 there has been a series of acquisitions in healthcare IT (HIT) market, which recently culminated in one of the largest, IBM’s acquisition of Initiate. Triggering this activity is the massive amount of federal spending on HIT, (stimulus funding via ARRA which depending on how you count it, adds up to some $40B) that will be spent over the next several years to finally get the healthcare sector up to some semblance of the 21st century in its use of IT. But one of the key issues with ARRA is that this money needs to be spent within a given time frame, thus requiring software vendors to quickly build out their solution portfolio, partner with others or simply acquire another firm. 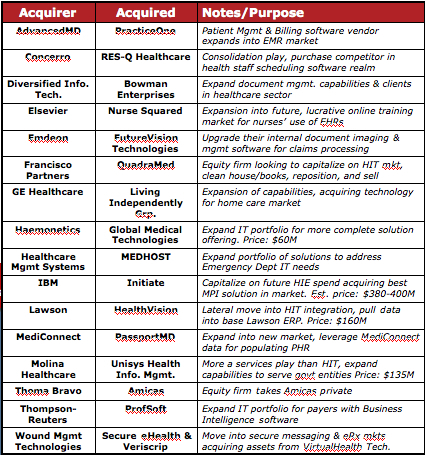 And it is not just traditional HIT vendors doing the acquiring (AdvancedMD, Emdeon, Healthcare Mgmt Systems, MediConnect, etc.). As the table below shows, many of these acquisitions are being driven by those who wish to get into this market (Thoma Bravo, Wound Mgmt Technologies, etc.) and capitalize upon future investments that will be made by those in the healthcare sector. We are only at the beginning of the sea change in the HIT market and one can expect far more acquisitions over the next 12-18 months as stronger players expand their portfolios and new companies enter the HIT market. If you are currently assessing an HIT solution for your organization, be sure to assess a vendor’s product road map and how they will meet your future needs (government mandates – e.g., meaningful use, interoperability, etc.) for if their answers are not absolutely clear, compelling and logical, you’ll better off looking elsewhere.